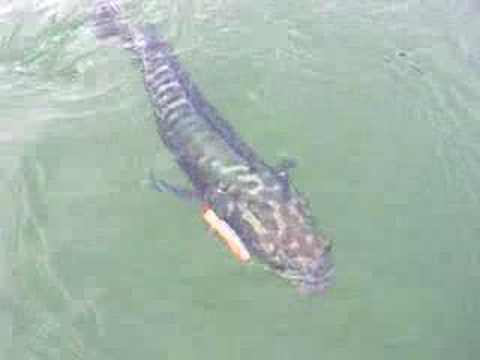 Tackle Fish: Asian Snakehead Fish, the silent predator. The Asian snakehead fish is actually not a single species; a lot of different species in the family Channidae are commonly referred to as Asian snakeheads. They are also known as Frankenfish and Channa fish. 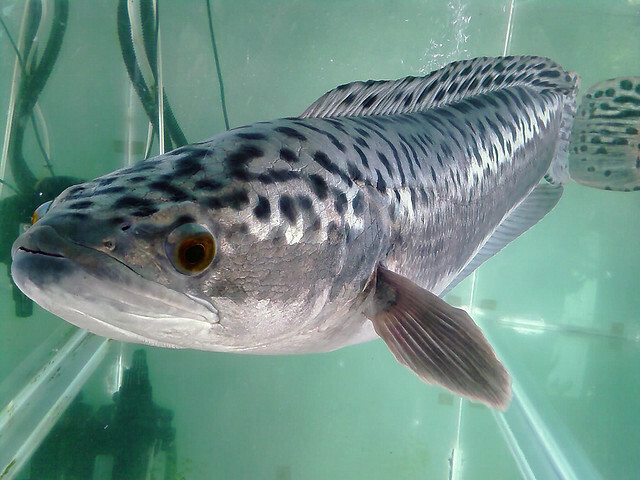 Snakeheads are not only native to South East Asia; many species have originated on the African continent. A few years back, the Asian snakehead fish received a lot of media attention since wild and breeding specimens were found in North American waters. The Asian snakehead is a very potent predator and if we allow it to become established outside its native region, e.g. on the North American continent, it could potentially disrupt the ecosystem. It is believed that the wild Asian snakehead fish that were found in the U.S. originated from fish markets and/or aquarists. Asian snakehead fish is a popular food fish in South East Asia and therefore also common in Asian food markets in the rest of the world. It can also be kept in aquariums, even though it requires a very large tank and plenty of food. To prevent Asian snakehead fish from being released into U.S. waters, importing live Asian snakehead fish to the U.S. is prohibited since 2003. Many aquarists objected to the nation wide ban, since Asian snakehead fish can not survive in the cooler parts of the country. An Asian snakehead fish released into a lake that becomes covered with ice during the winter will die, and many aquarists therefore feel that the Asian snakehead fish should be allowed as a pet in the northern parts of the country. An Asian snakehead fish needs to surface regularly to breath oxygen from the air and will die if prevented from doing this, e.g. by a layer of ice. The first wild and breeding Asian snakehead fish population found in the U.S. was living in the warm waters of Maryland. Before you decide to keep an Asian snakehead fish as a pet, you should always research that specific species in order to find out how large it can grow and how much it will cost to feed it. Many aquarists grow tired of their Asian snakehead fish when they realize that they must provide it with larger and larger aquariums, and feed it large amounts of expensive live food. It is not implausible that the wild Asian snakehead fish populations found in the U.S. were the result of someone spontaneously purchasing a few cool Asian snakehead fishes and then eventually releasing them into the wild. The biggest Asian snakehead fish species can reach a length of one yard (nearly one meter) and will need a very big aquarium to do well. All Asian snakehead fish species are predators and should be given meaty foods. They are fierce predators and watching them feed can be very entertaining. Do not be surprised if your Asian snakehead fish attacks a prey that is larger than half its own size. You can train your Asian snakehead fish onto dead food, and as soon as the fish understands that dead things can be tasty it will be very easy to feed. As a matter of fact, many specimens begin to investigate all dead things, including aquarium decoration, heaters etcetera.